We are one of the prominent manufacturers, traders, and exporters of premium quality Batter Filling Machine. This product is used for filling idli or dosa batter into different size packets. 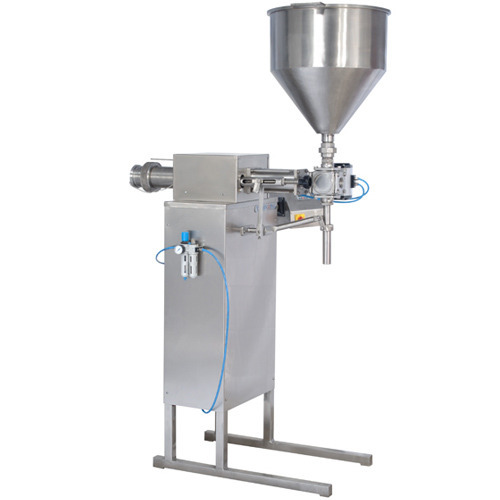 The offered filling machine is manufactured from high quality stainless steel, which is procured from trusted vendors. To ensure delivery of defect-free nature of products, this machine undergoes various quality assurance in-house test. Filling Accuracy: ± 1 to 3% Filling accuracy on single dose Depends of the nature of Liquid. Established in the year 2013, Gee Pee Equipments, Coimbatore, is listed amongst the leading manufacturers, suppliers, trader and exporter of a wide range of high quality Kitchen Equipment & Modern Kitchen Accessory, are a reputed name which is engaged in manufacturing, exporting and trading a wide range of Stainless Steel Kitchen Accessory. Our offered range incorporates Bakery Showcase, Food Processing Machines, Professional Kitchen Refrigeration Systems and Food Processing Equipments. Our offered range of products is manufactured by our professionals in accordance with the international quality standards. Offered products are widely known among the clients for their remarkable features such as sturdy construction, low maintenance and optimum performance. We have a sophisticated infrastructure facility that aids us in carrying out complete business process smoothly. Well-equipped with the advanced machines and technologies, our facility is segregated into various units. To handle the responsibilities of these units, we have appointed a team of experienced professionals. These professionals put their sincere efforts to acquire the higher level of clients’ satisfaction. Our exporting countries are UK, Gulf and USA.